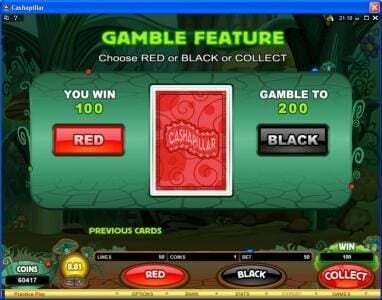 Cashapillar online slot machine pictures and slot feature list from Microgaming, play Cashapillar Slots for free. Cashapillar Slots 5 out of 5 based on 2 ratings. 2 user reviews. 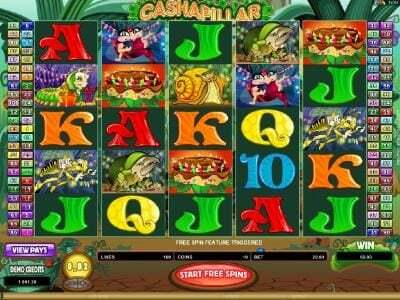 Cashapillar is a 5 reel, 100 payline video Slot from the folks over at Microgaming. 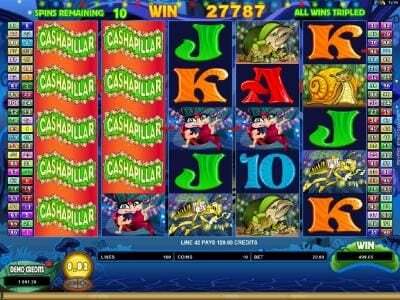 Cashapillar brings together scatter symbols, stacked wilds, multipliers and offers up the chance to win some Free Spins. The top line pay in Cashapillar is 400 coins but when you consider the potential of al 100 lines being won in a single spin you can see the attractiveness this slot brings to the table. It offers a top payout of 6 Million coins! – Yes we said 6 Million! 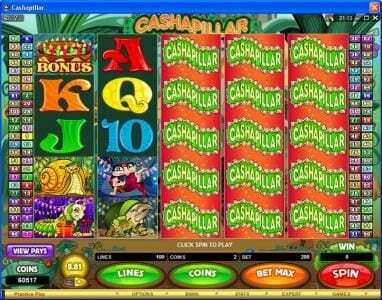 The theme of Cashapillar is based on Caterpillars and you will see plenty of greens and fuzzy creatures within this slot. The graphics are more along the lines of a classic styled slot but include rich vibrant colors into symbols that have been well thought out in design and the details taken to make them appealing. 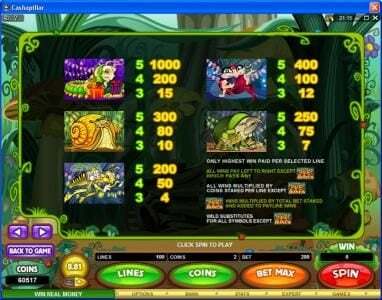 The character symbols this slot offers are incredibly well done and include some really well thought out details such as the colors and expressions on the faces of the little critters. There is a bumble bee, Queen bee, snail, hedgehog, and caterpillar. These are complemented with the standard reel fillers 10 through Ace. The Bonus symbols include the Cashapillar logo and the birthday cake with candles. The next slot feature to be found is the free spins. The free spins will be triggered when you find 3 or more of the cake symbols in any position on the 5 reels. This also serves as a scatter win as should you get two you will win 2 times your bet, 3 will pay 3 times your bet, 4 will pay 10 times and 5 will pay 100 times your triggering bet. 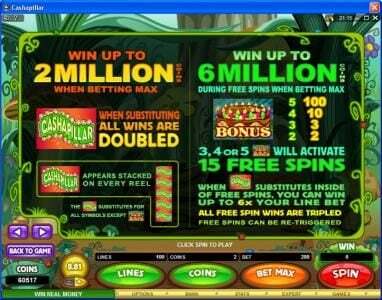 It will also award you with 15 free spins with a 3 times multiplier, which can be re-triggered. The interesting part is that the stacked wild symbol will, when completing a winning combination during the free spins double all wins – which means it multiplies all wins by 6! 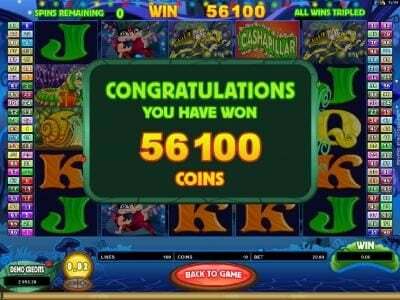 Should you land 5 reels fully wild you will win 6 Million coins! If you’re looking for a solid performing slot with the potential for life changing wins then Cashapillar is the slot for you. Try it today and see if you have what it takes to join those pesky bugs! Enjoyable slot, love that you can win up to 15,000 your bet ! 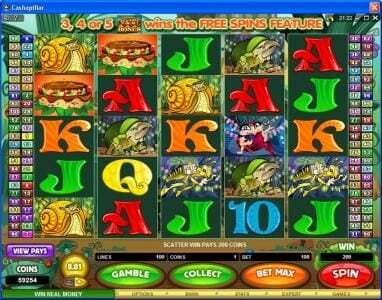 Has Scatters but no free spins like others. Bonus feature is way cool. Love the Cashapillar ! wow, cashapillar is a super fun game to play. 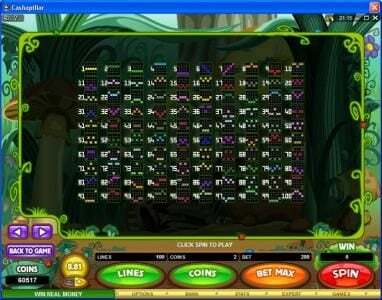 I played this game a lot when I could get my bankroll up enough to bet the 100 lines. 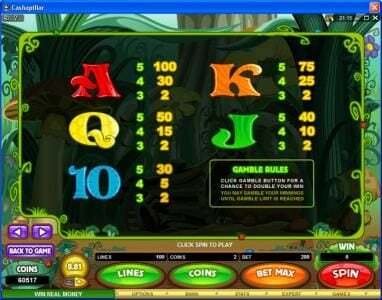 Although, you can play less lines and still have a fun time playing with stacked wilds and free spins.